One of the gravest threats to America today is the re-birth and growth of the hateful neo-Fascistic and White Supremacist movement. It presents a challenge to the survival of political discourse in America; a challenge that progressive forces, employing varying strategies and tactics, are meeting head on. The National Lawyers Guild is also on the front lines of this anti-bigotry fightback effort. 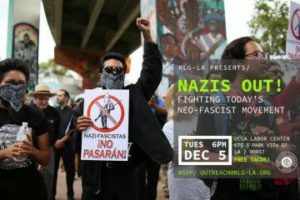 At our December 5th Membership Meeting we present a panel comprised of some of the groups and Lawyers Guild members who are in the forefront of this effort. We urgently ask you to attend this membership meeting in order to join in a discussion about the best ways to carry on our fight; and, to learn how you can be a part of this most essential struggle. There will also be free tacos and Skylight Books will have a table with related literature.